From November 4-10, sixteen middle school students and three chaperones from Kurobe, Japan are visiting Macon-Bibb to learn more about American culture and practice their English language skills. Students will attend a welcome ceremony at Macon-Bibb Government Center (700 Poplar Street) on Wednesday, November 7 beginning at 2:30 p.m. that will include Mayor Robert Reichert, the Consul General of Japan, Commissioners, and Cherry Blossom Festival Founder Carolyn Crayton. Students will spend all day Thursday, November 8 at Heard Elementary, Rutland Middle, and Rutland High Schools, and will perform for Rutland High School (6250 Skipper Road) students at 1:30 p.m. While in Macon-Bibb, the Japanese students will stay in the homes of Rutland High School students, which has hosted students from Japan for many years. The Japanese students will attend classes with their host student, which will give them a firsthand taste of American high school life. The students will also tour YKK and visit the Tubman Museum, Historic Luther Williams Baseball Field, Macon-Bibb Government Center, Heard Elementary School, and Rutland Middle School. The Japanese students will visit The Carter Center, the World of Coca-Cola and the official residence of the Consul General of Japan before returning to Japan on November 10. The American students who host Japanese students will have the opportunity to travel to Kurobe next fall to meet their host student again, and hopefully forge strong, lifelong ties across the Pacific. “The student exchange between Kurobe and Macon-Bibb has proven to be a great educational experience for all students involved. Not all learning takes place in a classroom by a textbook, often learning must be experienced and lived. This exchange gives 32 students rich cultural experiences and first hand life lessons that impacts them for a lifetime,” said Rebecca Morgan, teacher at Rutland High School. 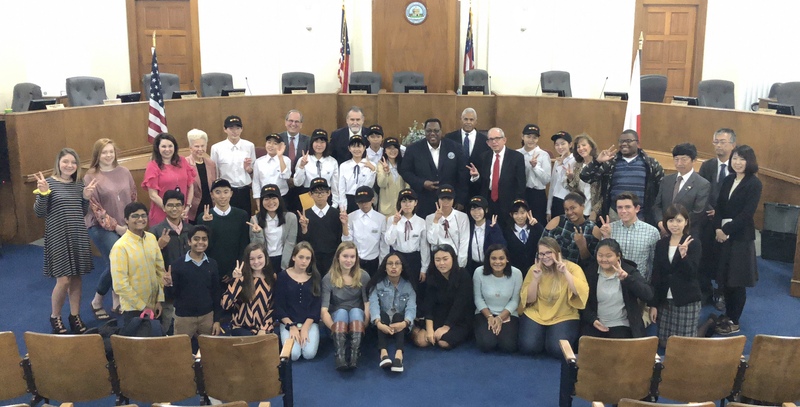 The student exchange takes place each year as part of the sister city relationship between Macon-Bibb and Kurobe, which was established on May 10, 1977. The partnership is facilitated by YKK, which has large manufacturing facilities in both cities. In the four decades since the relationship was established, more than 500 students have visited each other’s cities. Every two years, students from Sakurai High School visit Macon for a one week home stay and cultural exchange. Every other year, students from Kurobe’s four middle schools visit Macon, while high school students from Macon visit Kurobe in alternating years. The cities of Macon and Kurobe also have an active medical exchange between Navicent Health, Mercer University, and Kurobe City Hospital. With 111 companies operating in 73 countries and regions around the world, the YKK Fastening Products Group is one of the world’s largest manufacturers of slide fasteners, plastic hardware, hook and loop fasteners, webbing tapes, and snap and buttons. YKK is divided into six global regions and has integrated production and supply systems in place to meet the needs of customers worldwide.